Packing Size: 42cm length. 42cm width. 32cm height. Please read the following instructions and recommendations and use CAUTION at all times for the safe enjoyment of your real patio fire. Please keep these instructions in a safe place so you can read them again from time to time. ALWAYS FOLLOW THE USER INSTRUCTIONS. Failure to do so may result in personal accidents or fires spreading to property. Please remember, you are dealing with a real fire. PLACE your real patio fire on a FLAT surfaceÍ¾ you should NOT place it on a sloping surface where the fire might tip over. This should be a NON-FLAMMABLE surface such as stone, gravel or bricks. Do not place on grass which may turn brown. Do not place on wood which may turn brown or catch fire. DO NOT PLACE ON DECKING which may turn brown or catch fire. Protect wooden decking with a Gardeco FLOOR PROTECTOR or use bricks or concrete slabs. DO NOT place your real patio fire near bushes or plants or under treesÍ¾ the heat will damage the leaves and is a fire risk. DO NOT place your real patio fire under an awningÍ¾ it will burn or melt. DO NOT place your real patio fire near garden furniture, especially made of fabric or woven plastic, which may melt or catch fire. We recommend at least one metre minimum distance. DO NOT make a real fire inside a conservatory or summer house or shedÍ¾ real fires are designed to be outside, and fumes emanating from the fire made with wood, coal or charcoal are toxic and dangerous to health. 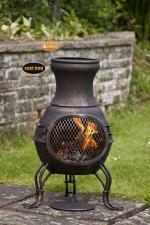 You can use your real patio fire indoors ONLY WHEN USING WITH THE GARDECO CHIM BURNER AND BIO-ETHANOL FUEL. DO NOT touch the real patio fire when burningÍ¾ the surface is hot and you will burn your fingersÍ¾ protect your hands with a Gardeco FIRE GLOVE. We recommend that gloves are used at all times. DO NOT allow children to play or run around the fire. Use a Gardeco CHIMENEA GUARD to prevent small children coming close to the fire. DO NOT over fuel the fire. If flames are coming out of the top of the chimenea, then the fire is too large. DO NOT PANIC if fuel falls out of the chimenea or for any reason flames spread out from the fire, simply extinguish spreading flames with earth or sand or water or use a Gardeco FIRE BLANKET immediately. DO NOT use petrol, paraffin or similar substances as fire lighters or as a fuel. The best method is balled newspaper and kindling, such as Gardeco OCOTE sticks. The best fuel is wood or charcoal. NEVER LEAVE A BURNING REAL PATIO FIRE UNATTENDED. Failure to do so may result in the fire spreading out of control and damage or destruction of property. Please ensure the fire is completely out before leaving the real patio fire unattended. We advise against using a real patio fire when it is windy or in the case of drought. Strong wind may tip the fire over which is a fire risk. Wind may also disperse burning material, which is a fire risk, particularly if the environment is dry as in the case of a drought. Use your chimenea or real patio fire for warmth and cooking, Chimeneas are beautiful to look at and can be used as garden decorations. You may use dry wood logs, charcoal, coal or briquettes for fuel. 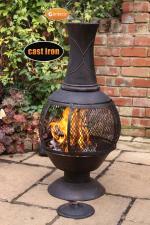 Chimeneas and other patio fires can be used to burn garden refuse such as leaves or branches. DO NOT throw fuel into a chimenea. Wet logs will create a lot of smoke. When cooking use locally made charcoal from renewable forests with minimal transport cost. Gardeco Wyre Forest Charcoal is made in the Wyre Forest in the UK West Midlands following to ancient rural methods. Gardeco CHIM LOGS, which are made from environmentally friendly recycled sawdust and burn slowly with little smoke. sawdust briquette, wrapped in a paper. Just light both ends of the paper and the log will burn for about 2Â½ hours. You cannot use Gardeco Fire Logs for cooking. Protect hands with Gardeco FIRE GLOVES when adding fuel. The more fuel is added, the more intense the heat, the larger the flames. Do not over-fuel the fire. No one wants smoke to spoil their party, a Gardeco EXTENSION CHIMNEY raises smoke above the heads of standing people and increases the draw enabling the fire to burn more efficiently. Safety is our main concern, so please use a CHIMENEA GUARD to keep small fingers well away from the fire. Cast iron chimeneas are very heavy. At least two people must carry one chimenea. Failure to do so may result in back injury or accidents. When moving the chimenea, make sure each person is holding it by the side handle and the top of the funnel- do not hold it in just one place. you are not cooking on your chimenea, you may decide to remove the BBQ grill if there is one in your chimenea. Please remove the lid prior to starting the fire. Leaving the lid on the chimenea will prevent the smoke from pulling up the chimney and the smoke will come out of the mouth instead. Please do not place the lid back on the chimenea once the fire is burning. This would increase the fire temperature and be a fire risk. Although your chimenea or patio fire is coated with heat-resistant paint, the PAINT WILL BURN OFF -this may happen after one use only. The bigger the fire, the faster the paint will burn off. A chimenea or patio fire can be re-painted with high temperature resistant paint available from Gardeco or local DIY store. Cast iron and steel corrode quickly in wet conditions and WILL RUST. Rusting is a natural phenomenon that cannot be prevented. It is not a product defect therefore Gardeco offer no guarantees against rusting. 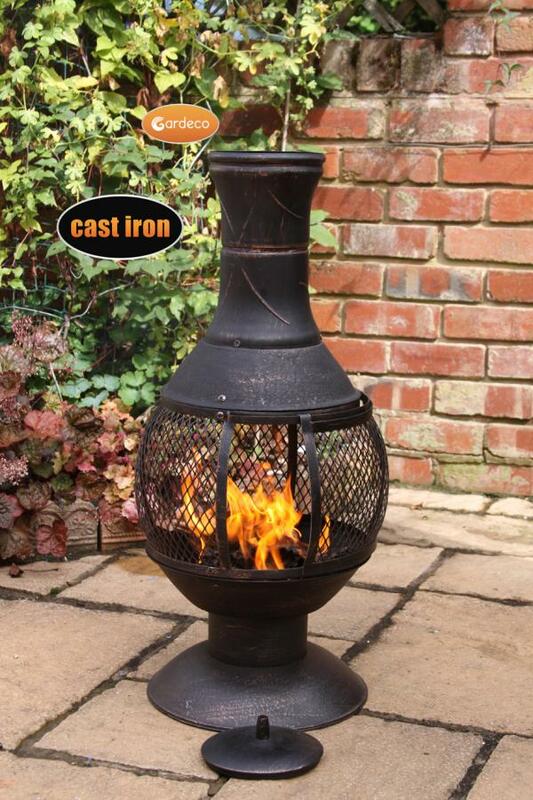 A rusty chimenea is still fit for purpose and can continue to be used. No refunds or replacements will be given for rusty chimeneas. To reduce the likelihood of rusting, wipe the whole surface of the product with oil after each use. Use a rag or brush to that effect. Bring inside or protect with a weatherproof chimenea cover. Gardeco sell many sizes of covers in various quality grades. If the cover traps dampness underneath it, the chimenea may still go rusty. Ideally, bring inside for the winter. Careful, never put a cover on a chimenea while still warm: it will melt. To maintain the finish, clean the surface with a soft cloth. Do not use a wire brush. Slight wear and tear scratches may appear with normal use. Bio-ethanol burns without smoke, soot or ash. 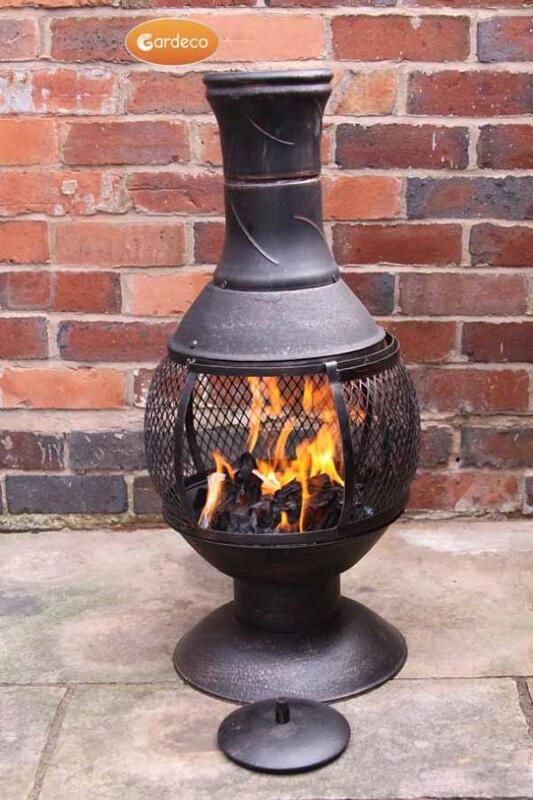 Simply position your Opera chimenea in an safe place in your house, and it turns into a real flame decorative heater! NEVER move your chimenea while the fuel is burning or when there is fuel left inside the Chim Burner. Please read, retain and follow the instructions and recommendations and use caution at all times for the safe enjoyment of your chimenea and bio-ethanol Chim Burner. DO NOT put on carpets, wooden or plastic flooring which may mark or catch fire. DO NOT place your chimenea near curtains, soft furnishings which may melt or catch fire. We recommend a minimum distance of 1 metre from any such materials. DO NOT place your chimenea near plants or items sensitive to heat. They will be affected by the heat and it is a fire risk. DO NOT place your chimenea where it is likely to be knocked over or bumped into. DO NOT place your chimenea under or near electrical cables or installations. It is dangerous. DO NOT place your chimenea underneath lamps or other fittings. It is dangerous and a fire risk. DO NOT lean over the fire and flames. Hair burns at low temperature and very quickly. DO NOT bring your face near the flames. DO NOT cover or leave clothes or newspapers on or near the chimenea. They are a fire risk. DO NOT use the chimenea to dry clothes which may catch fire. DO NOT allow children, especially small children near the chimenea. Especially DO NOT allow children to play or run around the fire. It is NOT a toy. KEEP pets away from the chimenea. OBSERVE the minimum room size requirements of 22 cubic metres. DO NOT place the chimenea in an unventilated room. DO NOT leave a fire unattended at any time. We recommend placing a fire extinguisher near to your fire as a safety precaution. All cooking accessories MUST BE THOROUGHLY CLEANED BEFORE USE. BBQ grills and other accessories are coated with vegetable cooking oil during manufacture but may have gathered dirt and dust therefore need to be cleaned in hot water and detergent to remove any foreign matter and debris. After cleaning and drying, cooking accessories are best lightly coated with vegetable cooking oil before use. After use, they need to be cleaned again with hot water and detergent and coated with vegetable cooking oil before storing. NEVER USE MINERAL OIL. If you do not oil cooking accessories they will rust, this could happen after first use. If you wash cooking accessories with water and donâ€›t coat with cooking oil rust can occur in a matter of hours. After use the surfaces of the cooking accessories in direct contact with the fire will be covered in black carbon soot. Soot can be washed off with hot water and household detergent or washing up liquid. Be careful because black soot residues will mark surfaces, tea towels or washing up cloths. All soot must be removed before oiling and storage. When cooking use dry wood or charcoal, and allow the wood gas to burn off as flames to leave hot glowing embers, cook on the embers. Only bring food out into the garden before cooking and it should be consumed after cooking as soon as possible. Food should be eaten while hot, immediately after coming out of the fire. Dispose of any cooked food not eaten. When cooking accessories are taken out of the fire, they are hot and need to be put onto a hard non-flammable surface, so the contents of the cooking accessory can be removed. DO NOT place the cooking accessory on the patio, grass, earth or directly on the ground. 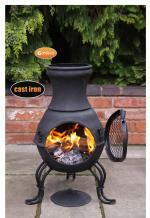 Best use a Gardeco chim table or Gardeco cradle for clay chimeneas. Parts of the cooking accessories in direct contact with the fire may become covered with carbon soot. Make sure you do not contaminate your food with soot. CAREFUL HOT! DO NOT TOUCH, steel and cast iron cooking accessories are very hot when taken out of the fire, do not touch with your fingers, protect hands with Gardeco FIRE GLOVES. Cast iron cooking accessories can remain hot after use, so ALWAYS be very careful and cautious when handling cast iron cooking accessories. NEVER leave a cooking accessory in the fire unattended. If you leave food in the fire, it will be burnt and inedible. The materials used are suitable for the greater intensity of outdoor fires, with long handles to ensure ease of use without burning your hands. It is NOT ADVISABLE TO USE KITCHEN PANS OR POTS to cook on patio fires. Kitchen pans may be designed for fires of less intensity and coated with plastic based non-stick materials which may melt in patio fires. Gardeco cooking accessories are designed for cooking food on an open fire. The Gardeco CHESTNUT PAN for roasting tasty chestnuts and can be used for cooking food wrapped in aluminium foil. Your cast iron or steel chimenea may already be equipped with a SWIVELLING BBQ GRILL, made of either chromed steel or cast iron for barbecuing on your chimenea. These can also now be purchased separately from the chimenea itself. The Gardeco SWIVELLING HOT PLATES AND FRYING PANS can be fitted in place of the BBQ grill on most steel and cast iron chimeneas. For more information on each cooking tool, please see our website www.gardeco.co.uk. All cooking accessories, whether supplied with the product or separately must be washed before first use to remove any potential dirt due to manufacture or packaging operations. We recommend you also wash them before use every time subsequently, even if they were put away clean. All cast iron cooking accessories including BBQ grills and hot plates are coated with vegetable oil to stop rusting when you first get them. After use, all cooking accessories need to be cleaned in soapy water to remove soot and cooing residue. Dry them well after cleaning and immediately coat them with vegetable oil before putting away. Failure to coat with vegetable oil will mean the accessory will start rusting. NEVER use mineral oil which is harmful to human health. For cooking accessories purchased separately from this product, follow the cooking instructions supplied with the packaging. If your chimenea is equipped with a swivelling cast iron BBQ grill, remember to remove and wash it thoroughly and coat it with vegetable oil before and after use. Put food directly onto the BBQ grill, either pre-heated or not. For pizzas, use the pizza stone. Use the multi-purpose tool provided to swivel the BBQ grill in and out. Never touch the BBQ grill with your hands while hot. A cast iron BBQ grill will remain hot a long time after use,even if taken out of the chimenea. 1. Assemble Support (J) to Base(K) with three M6 X 15 Bolt (T3), Washers (U), Lock Washer (X) and Nut(V). Put the Lock Washer (X) before the nut on all fixings. 2. Assemble Bottom Bowl (H) to Support(J) with three M6 X 15 Bolt (T3), Washers (U), Lock Washer (X) and Nut (V). 3. Assemble Mesh Body (E) to Bottom Bowl (H) using two Connection Piece (L), with four M6 X 20 (T1), Washers (U), Lock Washer (X) and Nut (V). 4. Assemble Top Bowl (D) to Mesh Body (E) using two Connection Piece (L), with four M6 X 20 (T1), Washers(U), Lock Washer (X) and Nut (V). 5. Assemble Flue(C) to Top Bowl(D) with three M6 X 30 Bolt (T2), Washers (U), Lock Washer (X) and Nut (V). 6. Attach Mesh Door (F) on Mesh Body (E). 7. 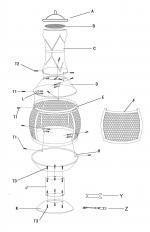 Put Flue Grill (B) and Rain Lid (A) on top of Flue (C). Now check and tighten all fixings, assembly is complete.